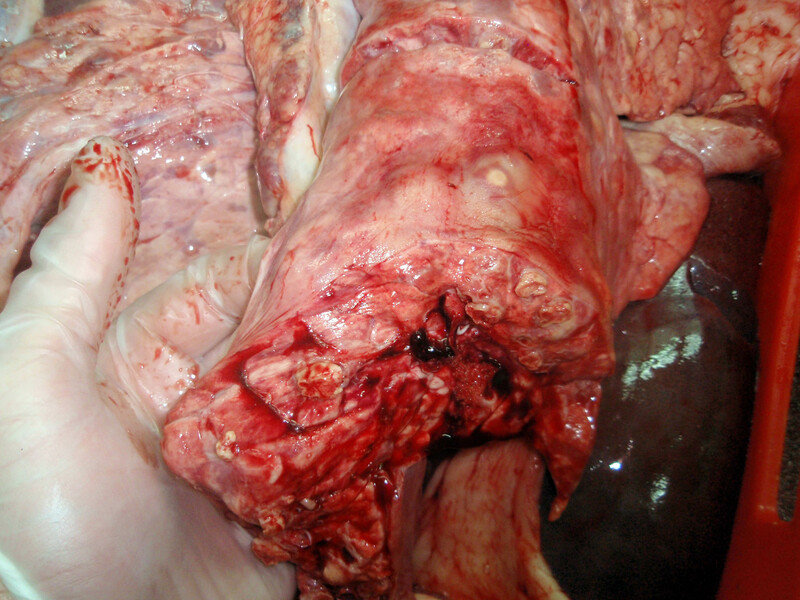 Description of a series of cases of granulomatous lesions in pigs carcasses caused by Mycobacterium avium. 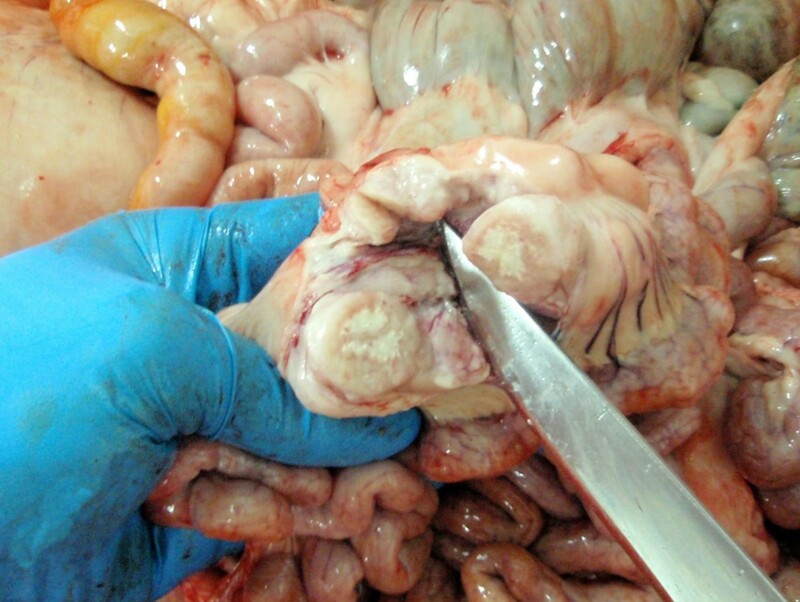 Between late 2010 and early 2011, several inquiries were submittetd to SESC regarding the presence of granulomatous lesions in pig carcasses, coming from up to 5 different farms. 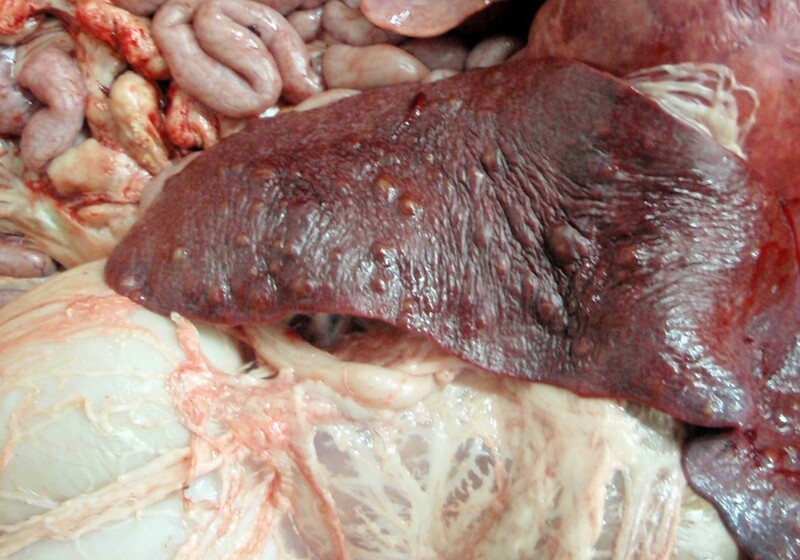 The lesions were nodular, of whitish appearance and sometimes were calcified and affected the liver, spleen and lungs showing a miliary distribution. 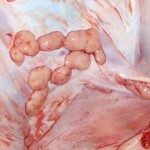 The lymph nodes were also involved (see Figures 1 to 4). Histopathological examination showed necrotic lesions associated with granulomatous inflammatory infiltrate with giant multinucelated cells. 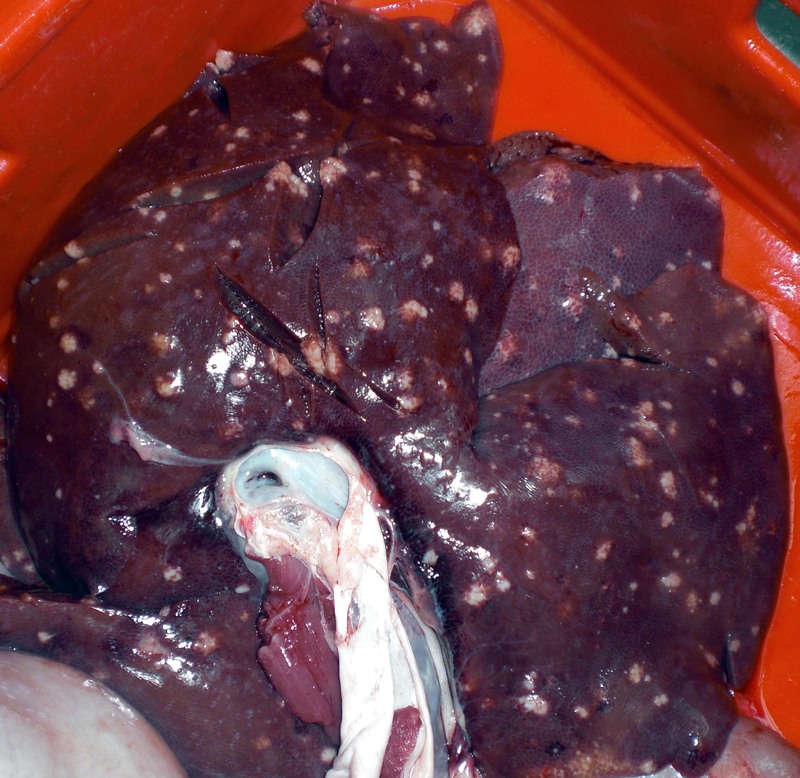 The lesion was diagnosed as multifocal, generalized granulomatous-necrotizing splenitis, hepatitis and lymphadenitis. Ziehl-Neelsen revealed, in some cases, the presence of acid-resistant bacteria. Lesions and the Ziehl-Neelsen staining indicated that it was a mycobacteriosis. A molecular study and microbiological culture were performed to confirm the diagnosis and determine the mycobacteria causing the lesions. Direct PCR of the lesioned tissue: a positive result was obtained, although weak, indicating that it might be a mycobacteria included in the M. tuberculosis complex , this complex includes species causing human and bovine tuberculosis. It has been described that the DNA IS6110 target used for identification of mycobacteria from this complex may cross-react with other mycobacteria such as M.avium complex, M. intracellulare complex and M. xenopi among others (Carridge et al. 1993). Microbiological culture and PCR of growing colonies: using two different decontamination methods mycobacterial growth could be isolated . PCR from these colonies confirmed that it was non-tuberculous mycobacteria (see Figure 5). Molecular characterization of bacteria of the genus Mycobacterium: the reference laboratory confirmed the presence of bacteria of the genus Mycobacterium and identified them as M.avium. subsp. avium. One possible source of the infection outbreak would be a M. avium subsp. 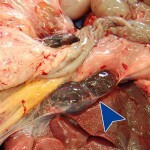 avium contamination present in the feed of animals (fairly common pathogen in gallinaceous birds which can be excreted in large quantities through the chloaca). The fact that in most cases a clear involvement of the abdominal cavity was observed supported a digestive entry of the infectious agent. 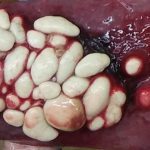 This case has been published in Veterinary Record. Caseous lymphadenitis in the mesenteric lymph node. Granulomatous lesions in the lung parenchyma. 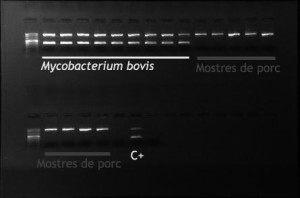 PCR of isolated mycobacteria colonies. The banding pattern observed indicates that the growth obtained from swine samples corresponds to non tuberculous mycobacteria (only upper band). 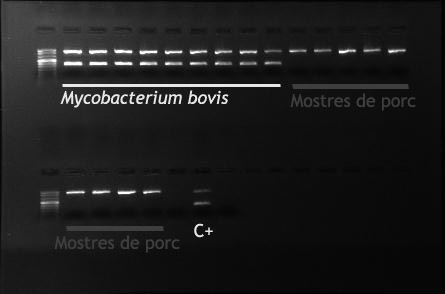 Mycobacterium bovis: culture samples from bovine tuberculosis affected cattle (double band). C +: positive control. This entry was posted by SESC on 28/02/2011 at , and is filed under Abdominal cavity (porcine), Liver, Lymphoid (porcine), Porcine. Follow any responses to this post through RSS 2.0.You can leave a response or trackback from your own site.